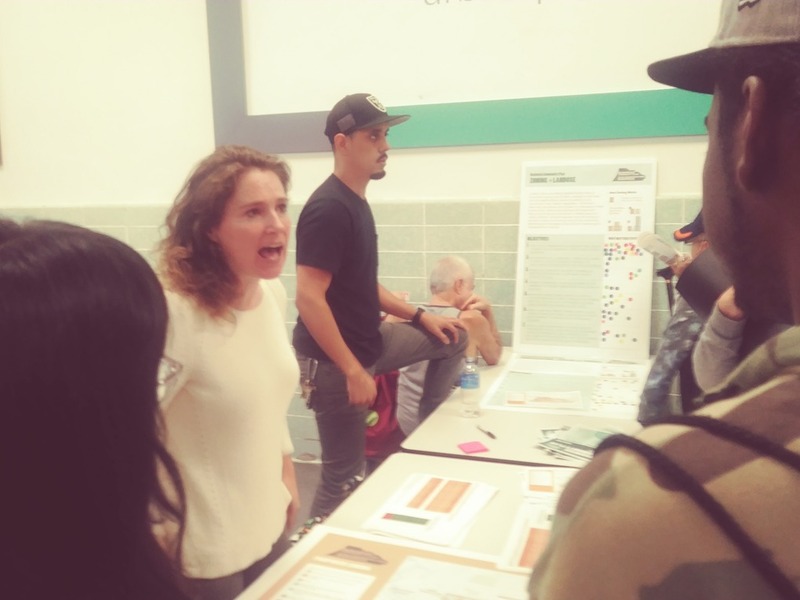 On Saturday, Sept. 22, the long-awaited Bushwick Community Plan was released to a packed auditorium at the Academy of Urban Planning. “If we don’t present the change, change gonna change us,” says Odolph Wright, parliamentarian of Community Board 4. 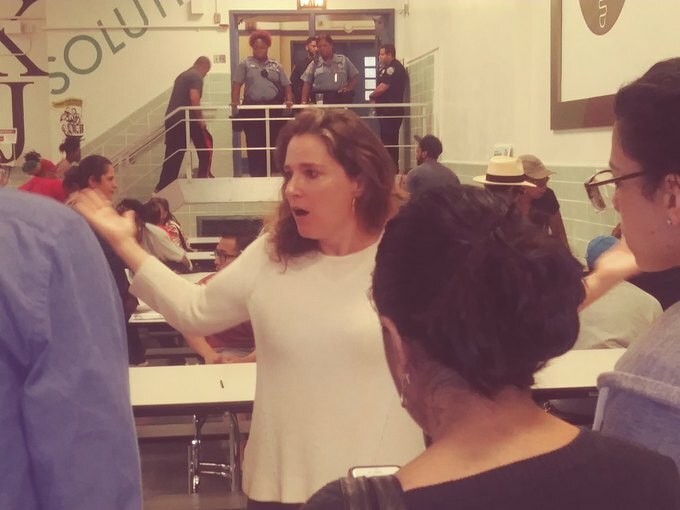 On Saturday morning, Wright sat at a cafeteria table with Robert Camacho, also of Community Board 4, before the opening remarks at the Bushwick Community Plan release where to begin. A diverse crowd filled the multi-purpose room, many greeting each other with warm hugs and familiar greetings in English and Spanish before they found seats around the cafeteria tables. Bushwick residents and community organizations have worked along with council members and members of Community Board 4 since 2014 to develop the Bushwick Community Plan, a proposal which covers community needs holistically, from adequate, truly affordable housing, to jobs creation, accessible healthcare, recreation centers for youth, and resources for seniors. 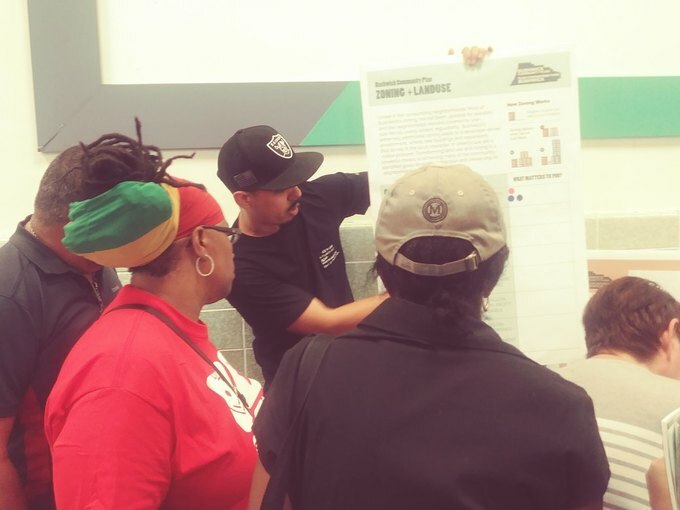 Over the nearly four years, organizers say, some 70 community meetings and four community summits have been held to gather input from Bushwick residents and iron out exactly what the plan should contain. The Bushwick Community Plan in its current incarnation is a document of 73 pages, with objectives in 12 areas, outlining the myriad needs of Bushwick’s residents. At the heart of the plan, though, is affordable housing. “It’s a tale of three cities,” says Camacho, “The rich, the middle class, and the poor. But now, all you got is the rich and the middle class—they’re pushing the poor out. We don’t want M to R (Manufacturing to Residential) rezoning,” Camacho insists, “We want jobs. The only way we could do it is with deeply affordable housing. Alex Fennell, of Churches United for Fair Housing (CUFF) says that the 2005 waterfront rezoning started today’s wave of redevelopment. “Williamsburg kicked off waves of gentrification,” says Fennell. “There has been a wave effect that moved through Williamsburg so quickly, to what became east Williamsburg, which is East Bushwick. So many residents are facing really acute pressures. Feedback on the plan. Photo by Bobi Morgan Wood for Bushwick Daily. Council Member Antonio Reynoso spoke first at the event, telling the packed house, “The goal is the preservation of the character of the community.” Reynoso explained that the council members did not have voting rights on the Bushwick Community Plan; their role was to make sure [the community members] were respected. “I want to make sure that this is the first plan that gets pushed through, word for word. I want this to be the first rezoning plan that the community supports, not that the community fights,” he said. Anne Guiney described to the listening crowd “a beautiful, difficult, long experience” of putting together the plan, which took “around five or six years”, starting in 2013, when Brooklyn Community Board 4 sent a letter to their council members addressing the development occurring in the neighborhood. Guiney described the process of attrition from 120 volunteers to those few whom she described as the “diehards” which include Community Board 4 members who were present on Saturday. Short praised parts of the community plan calling for the creation of new, affordable housing, and higher buildings only if they contain either 100% or significant affordable housing. Councilwoman Lydia Velasquez presented opening remarks, as did Kevin Worthington, Boris Santos, and Ingrid Ramos, who described herself as a relatively new Bushwick resident of four years. Ramos would go on to man the Open Spaces table in the breakout sessions that followed the opening remarks, while Lopez manned the Land Use and Zoning Table. The crowd dispersed to the cafeteria tables around the multi-purpose room to listen to presentations, read facts, and provide feedback on the long-awaited plan. Patti Rodriguez of Mi Casa No Es Casa engaged in a passionate conversation with Anne Guiney, part of the Brooklyn Community Plan Steering Committee at one of the break-out discussion tables. Rodriguez maintains that for the community to engage with the city by putting forward the plan is a mistake. “It’s not really a community plan, it’s a nonprofit plan,” Rodriguez said, adding that she knows that the people on the nonprofits are drawing salaries, and therefore are not actually volunteers. Plan discussion. Photo by Bobi Morgan Wood for Bushwick Daily. Guiney, like others echoed that at the end of the day, the city holds all of the power. “The only power we have is to make hell of a lot of noise," she said.